At this year’s MMA CEO & CMO Summit, the annual think tank for the mobile industry’s top influencers, leaders and decision makers, we’ll explore how mobile has indelibly changed the game around customer engagement and driving sales. While there is no doubt that mobile is the closest you can get to your consumers, leveraging this unique power is a complicated choreography of multiple touchpoints to build a positive brand experience for new and existing customers across the purchasing funnel. Harnessing this power is key for CMOs tasked with profitable growth. or other… the content on stage, intimate one-on-one conversations and deep dive roundtable sessions will inspire you and present tangible strategies to captivate consumers in relevant and unique ways never before imaginable. 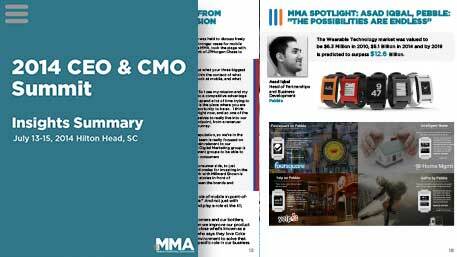 The MMA Mobile CEO & CMO Summit is an exclusive, invitation only event.